An NIU accounting major spent his summer researching and creating a database and web site that he hopes will help immigrants find access to health care. The son of immigrants from Mexico, Yosue Perez, 21, was born in Chicago and is currently a junior. He said the project started out as summer research and quickly evolved into something that might hopefully make the lives easier of others who grew up like him. He created the project as part of the Summer Research Opportunities Program coordinated by the Office of Student Engagement and Experiential Learning (OSEEL). Through the program, Perez was matched with Dr. Beatrix Hoffman, Associate Professor of History, to research resources for primary care available to immigrants. “As I gathered more information, I realized there were a lot of articles on the topic, but nothing was put in a way that was easy to understand, so I thought that creating a web site that was straightforward with the information would make it easier for people to understand my research,” he explained. Spencer Janis, SROP Student Coordinator, said he sees Perez’s project as an example of how NIU students can make a big impact through their academic work. Janis said Perez’s project was one of 10 in SROP this summer. “They are tackling a variety research questions, hypothesis, and contributing incredibly to their respective disciplines,” he said. Janis said when he read Perez’s work and saw his web site, he felt inspired. “I realized that Yosue’s work could be incredibly beneficial for immigrants,” he said. 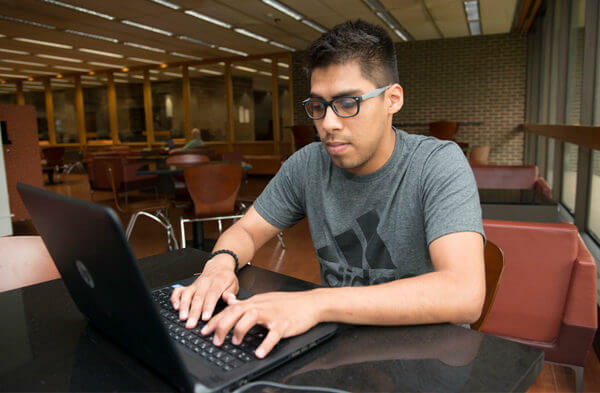 For his research project, Perez created an online resource that compiles a list – complete with a map – of facilities and organizations where immigrants have access to health care in Illinois. Perez said he did this as a way to potentially address the health care needs of the nearly 11 million immigrants across the country. “At first I did not really think building a web site would play such a role in my overall project,” he said, explaining he initially started building the site as a way to organize and understand his own research material. He said Janis helped him to see how the site was beneficial for others as well, and so his efforts toward building the web site grew. “I hope that the web site can make is easier for immigrants to know that there are resources available that will provide primary care to them,” he said. Perez said being the son of immigrants – his parents moved here from Mexico 22 years ago – has shaped who he is in ways that he is only beginning to understand. He recalls watching his parents struggle to support his family, which was especially difficult since they did not have a college education. Perez said he learned this summer that he can make an impact through research. Janis said Perez’s work is exactly what SROP hopes to make possible. “Science should strive just as hard to making the world a better place as it does toward the pursuit of discovery, and Yosue’s work exemplifies both,” Janis said.